Will Trump energize the Latino vote? LAS VEGAS — It’s a persistent paradox in American politics: Many Hispanic families have an immense personal stake in what happens on Election Day, but despite population numbers that should mean political power, Hispanics often can’t vote, aren’t registered to vote, or simply choose to sit out. Enter Donald Trump, and the question that could make or break this year’s divisive presidential election in key states. By inflaming the anti-immigrant sentiments of white, working-class men, has the Republican nominee jolted awake another group — the now 27.3 million eligible Hispanic voters long labeled the sleeping giant of U.S. elections? Hispanics now represent the nation’s largest ethnic community with some 55 million people. More than half are U.S.-born, an additional 6.5 million are naturalized citizens, and the others are legal residents or here illegally. Most trace their familial roots to Mexico, one of Trump’s favorite targets. A cornerstone of Trump’s platform is building a wall along the entire Southwest border — and forcing Mexico to pay for it. How? By threatening to cut off remittances those living in the U.S. send to relatives down south. He publicly attacked and questioned the impartiality of an Indiana-born federal judge hearing a lawsuit against him because of the judge’s Mexican ancestry. He’s called protesters in New Mexico “thugs who were flying the Mexican flag” and accused the state’s governor — a Republican who also happens to be the nation’s first female Hispanic governor — of “not doing the job.” Half of that state’s population is Hispanic, as are 40 percent of the state’s eligible voters. Skip ahead to 2016, and surveys that show most Hispanics plan to vote against the Republican nominee. A Fox News Latino poll conducted in May found 67 percent back Hillary Clinton and only 23 percent support Trump. Lionel Sosa, a prominent Mexican-American advertising and marketing executive in San Antonio, was once dubbed one of the top 25 most influential Hispanics in America by Time magazine. He helped devise strategies to attract Latino voters for the likes of Ronald Reagan, George W. Bush and John McCain. That was before Trump. In a June column in the San Antonio Express-News, Sosa announced he’d be leaving the party upon Trump’s formal nomination. “A thousand points of light has been replaced by a thousand points of anger. In place of compassionate conservatism, our nominee promotes callousness, extremism and racism. And instead of a unifier, the party now cheers the ultimate ‘us against them’ proponent. Divisiveness incarnate,” he wrote. Republican fears of Hispanic backlash are rooted in what happened after their party targeted illegal immigration in California in 1994. Gov. Pete Wilson tied his re-election campaign to a ballot measure, Proposition 187, to deny government benefits and access to public schools to people in the country illegally. The measure passed, and though it was later struck down as unconstitutional, a growing Hispanic population was infuriated. In the years since, more Latinos have been elected to office in the state and the GOP has dwindled to a mere footnote; no Republican has won a statewide election in California since 2006. Proposition 187 wasn’t the only factor in the change — other groups in California, like coastal whites, were shifting Democratic in the mid-’90s, and Hispanics already leaned against the GOP. But the loss of California has become the example of the risk Republicans run alienating a fast-growing ethnic group. There is reason, though, to be skeptical. Overall, the Hispanic voting record is not good. One obstacle is some 7.2 million Hispanic adults are here illegally and are ineligible to vote, according to estimates from the Pew Research Center. Another 5 million, while living here legally as temporary or permanent residents, are not citizens. Finally, nearly one-third of all Hispanics in the U.S., some 17.9 million, are under age 18 — young people like Edysmar Diaz-Cruz, a high school student from Miami, whose 18th birthday comes one month after the presidential contest. “It’s so disappointing because I’ve been closely following this year’s campaign,” she says. Relatively few of the Hispanics who are eligible to vote actually register and then cast ballots. In the 2012 election, only 48 percent of eligible Hispanic voters turned out, according to the Pew Research Center . That’s compared to a 66.6 percent turnout rate among blacks and a 64.1 percent rate among whites. 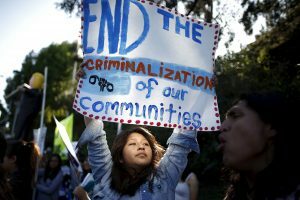 In Arizona, a decade of tough-on-immigration policies from Republican officials has triggered no popular uprising by the state’s growing Hispanic population; the GOP still controls all state offices, and activists acknowledge that increasingly conservative white votes there tend to mitigate gains among Hispanics, who now represent about one-fifth of the state’s voters. In Texas, where 39 percent of the population is Hispanic, Democrats have been shut out of statewide elections for decades. During 2014’s midterm elections, fewer than 2.3 million Texas Hispanics reported being registered to vote, or about 46 percent of the nearly 4.9 million who were eligible, according to U.S. Census Bureau surveys. Turnout was even worse: That year, 22 percent of eligible Texas Hispanics reported voting compared to nearly 42 percent of eligible whites and 35 percent of eligible blacks. “We’ve been spending our money wrong,” concedes Crystal Zermeno, director of special projects for the Democratic field organization Texas Organizing Project. Unions, nonprofits and political campaigns have struggled to grow the Hispanic electorate, with mixed success. In Colorado, Democratic groups have invested for years to reach out, and Hispanic registration and turnout have edged higher. In 2013, a state assembly that had been tough on illegal immigration allowed people in the country illegally to pay in-state tuition at public colleges and universities. Nevada is another battleground state, where some 17 percent of eligible voters, or 328,000 people, are Hispanics. Here, Latinos have clearly demonstrated the power they wield when they either turn out or stay home. In 2008 and 2012 they helped President Barack Obama; they were critical in re-electing Sen. Harry Reid in 2010. In the 2014 midterms, though, Hispanic turnout plummeted, and Republicans swept every statewide office and won control of both houses of the Legislature for the first time since 1929. This year — with Trump priming the pump, and with former state Attorney General Catherine Cortez Masto running to replace the retiring Reid and become the first Latina senator — resources are flowing. Groups like Mi Familia Vota are sending in staff from around the country and hiring local volunteers to step up registration and turnout efforts. In June, two days after graduating from high school, Fabiola Vejar stood outside a Latin grocery store on a sweltering afternoon quizzing a parade of customers in Spanish: “Are you registered to vote?” Most shook their heads no. Vejar followed up: “Are you eligible?” Again, most responded in the negative. One man laughed and bellowed: “Soy Mexicano!” I’m Mexican! Vejar cannot vote. Now 18, she entered the country illegally from Mexico with her mother when she was 2 years old, after her father died of leukemia. Her future, and that of her family, largely depends on this election. She is shielded from deportation under an Obama administration program that protects those brought to the country illegally as children. Hillary Clinton has promised to keep that program, and Trump to end it. Trump also has pledged to deport every person in the country illegally, and that would include not just Fabiola, but her mother and stepfather. Her two brothers are both U.S. citizens, but not yet 18. So Vejar volunteers with Mi Familia Vota, encouraging others to be heard at the ballot box. Some, like Jose Martinez, are unconvinced. The 40-year-old security guard voted twice for Obama but told one of Vejar’s colleagues he is sitting this election out because he’s disappointed the president did not pass a broad immigration overhaul. Joe Enriquez Henry remembers the moment he set out to disprove the conventional wisdom that Hispanics just don’t vote. It was 2002, and then-Iowa Gov. Tom Vilsack, a Democrat, signed a bill making English the state’s official language. Vilsack now says he regrets the decision, but the governor then explained to Henry that Latinos just were too small a voting constituency to convince him to put down the pen. Henry, whose mother’s family came to the U.S. from Mexico more than 100 years ago, vowed he’d help Iowa’s small but significant Hispanic population — now more than 170,000, or nearly 6 percent of the state’s population — make their voices heard. Years of work paid off on Feb. 1, when as many as 13,000 Hispanics turned out for the state’s caucuses. Only about 1,000 had attended in 2012. “The Democratic and Republican parties think we don’t vote, so we wanted to prove that we do,” says Henry, a vice president of the League of United Latin American Citizens. There was no magic formula. Henry scraped together $200,000 that paid for a few staffers who made phone calls, distributed fliers and knocked on doors to talk about the importance of voting with people like Mayra de Catalan, an immigrant from El Salvador who works as a bank analyst. The Des Moines resident has been in the U.S. for two decades and became a citizen only five years ago; she says she had not even considered voting. That’s the same message that Victor Juarez is spreading in Nevada. He has been a member of Culinary Union Local 226 since 1989, when he started work as a cook at the Circus, Circus casino. The union represents 55,000 casino and hotel workers, half of them Hispanic and many of them immigrants; it has harnessed Las Vegas’ housekeepers, cooks and janitors and turned them into an electoral powerhouse. Juarez has been taking paid leaves of absence to work as an organizer for Culinary, traveling around town and knocking on doors of other union members to get them to the polls. He himself only became a citizen, able to vote, after the 2004 election; he was working two jobs to put his children through school and says he didn’t have time. Often he finds families headed by people with little education who don’t speak English and are wary of participating in the system. Xiomara Duenas is one of them. She immigrated legally to the United States from Cuba in 1996 to join her father. She worked at a seafood processing plant in New Jersey before moving to Nevada in 2012 after medical issues forced an early retirement. She had always believed that her shaky English prevented her from becoming a citizen. She was resigned to the idea that immigrants didn’t have the same rights as native-born Americans — until Trump’s candidacy. Duenas found a Culinary Union citizenship workshop where Spanish speakers guided her through the process. Last November, she became a citizen. This November, she plans to act. Sergio Bustos reported from Miami. Associated Press reporters Will Weissert in Austin, Texas, and Russell Contreras in Albuquerque, New Mexico, contributed to this report.